QED XT40 review | What Hi-Fi? This new QED cable might be a touch pricier than the average cable we test, but if you can stretch to its £10/m price, then we recommend buying it. The XT40 builds on the British company’s XT range, and consists of sturdy plugs at either end of a strong, yet pliable jacket. Looks don’t necessarily reflect its price, but not to worry – performance more than makes up for that. Our reference system sounds lavishly detailed with the XT40 cable wired in: its delivery is transparent and beautifully balanced. With The Smiths' Well I Wonder, it picks out the subtle difference between the acoustic guitars. Cymbals have zing, but never teeter on brightness, and there’s depth and tightness to the underlying bass guitar too. The QED unearths plenty of variation in these notes compared with last year’s Award-winning AudioQuest FLX-SLiP 14/4. Its full-bodied presentation with our system makes the AudioQuest sound a little lean in comparison, too. Morrissey’s soothing baritone vocals make their mark, striking a nice balance between expression and solidity. 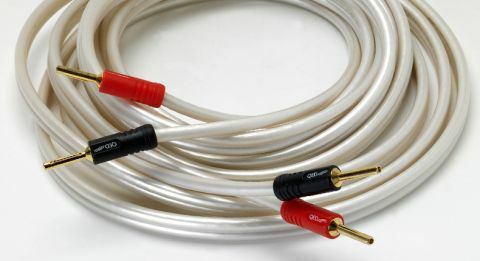 The QED XT40 is a special cable – detailed, balanced and authoritative, and we think it’s worth every penny. Go treat your system.